ClotCare Online Resource is pleased to provide the following information on Chronic Thromboembolic Pulmonary Hypertension Day – November 18, 2014. This information was provided by the Pulmonary Hypertension Association with edits by Henry I. Bussey, Pharm.D. Because November is Pulmonary Hypertension Awareness Month, the Pulmonary Hypertension Association (PHA) has declared November 18 as Chronic Thromboembolic Pulmonary Hypertension (CTEPH) Awareness Day, and wants you to know about this progressive and debilitating disease. • CTEPH is a form of pulmonary hypertension caused by old blood clots in the lungs (pulmonary emboli). • In most patients who have suffered a blood clot, anticoagulants (drugs to stop blood clot formation) are enough to restore blood flow to the lungs, improving breathing and exercise tolerance. A minority of patients, however, do not respond adequately to anticoagulants alone and develop CTEPH. • Patients may develop CTEPH without any known history of blood clots. • CTEPH, like other forms of pulmonary hypertension (PH), is a progressive and debilitating disease. Unlike other forms of PH, however, a cure for CTEPH exists, if the disease is caught early enough. 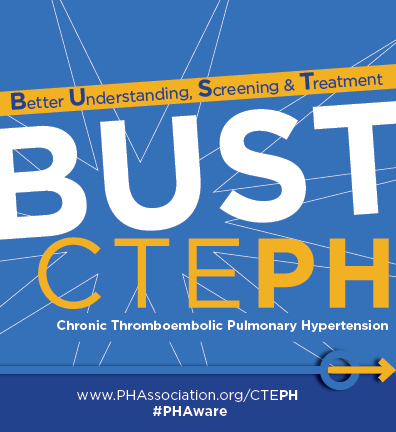 The PHA is seeking to promote a Better Understanding, Screening and Treatment – or “BUST’ [of] CTEPH. • A webinar series on CTEPH for medical professionals and patients. • The purple illumination of Niagara Falls at 8p.m. on November 18 in honor of CTEPH Awareness Day. • An outcome evaluation survey that will measure medical knowledge of CTEPH before and after CTEPH Awareness Day. By Henry I. Bussey, Pharm.D. in Uncategorized on November 13, 2014 .